Funny animal pictures are part of my Plan "B" to diversify and increase my security and earning potential. More than once I have been introduced as the “the guy who creates the cute, funny animal pictures”. I have to admit, it is with mixed emotions that I hear that. As a photographer my ego can’t help but want to be known for “serious” work. However, I really don’t do much “serious” work. Further, after a career of some thirty years as a professional photographer, I have never received as much genuine thanks for creating images as I do for the funny human-like animal pictures. A week after 9/11 a United Flight Attendant sent me an e-mail telling me that one of my humorous cat pics brought the first smile to her face in a week. A week doesn’t go by without my getting at least one random phone call or e-mail from someone who is thanking me for creating those photos and bringing a smile to their face. Now, with the stock photo business going through such transitional pains, I have a renewed appreciation for those anthropomorphic photo creations. I can’t help but believe that the market for products with photos imprinted on them, now made accessible by the Internet, represents a truly enormous opportunity. There are over 37 million cat owners in the U.S., and over 43 million dog owners. All I want is about ten cents apiece! According to Wordtracker there were over 23 million searches for “funny animal pictures”. Hey, if one percent of them bought an animal print from me, and I made a mere $5.00 per print, lets see…I would make (my math is always suspect here) oh, about $1,150,000.00. If it were only so easy! But there isn’t anything easy about it. Shooting animals is certainly challenging. The stripping out of hair and fur necessary for compositing my anthropomorphic offerings sure isn’t easy. Perhaps hardest of all is attracting traffic to my site in sufficient quantities to actually provide a significant amount of revenue. But then, if it were easy, everyone would be doing it. For us photographers, stock or assignment, now is an important time to diversify. By having this “funny animal” sub-specialty I am tapping into a much different revenue source than the standard stock photo licensees. By selling photos as products, i.e. coffee mugs, T-shirts, tote bags, mouse pads and more through CafePress, I am reaching a different clientele. Photographic prints represents yet another diverse source of income that ought to be accessible to any photographer. Just like in the investment world, diversification provides an increase in security, and who knows, you just might end up liking the “plan B” more than your “day gig”! Having a “plan B” helps me relax a bit and I think actually makes me better at my primary task of creating effective stock photos. I try and work on each aspect of my business each day, and changing tasks, such as taking a break from compositing to work on key wording, or switching from uploading images online to writing a blog entry or article, helps keep me invigorated and enthusiastic. For example, the first thing I did this morning was create a composite stock photo for Blend, followed by working on SEO strategy, then entering sales reports into my database, and finally, working on a stock photo for Getty. Now I am at home writing this blog on my laptop, and in just a few minutes it will be time to veg for a bit and watch the Olympics. Actually, that is going to happen right now…later! Quad Sculling, four people rowing a boat, demonstrates teamwork, adversity, challenge and risk in this "impossible" stock photo. This image of Quad Sculling (in sculling a light boat is powered by people using two oars each…quad sculling refers to such a boat with four people) is exactly the kind of image I most enjoy creating. It has a strong, but flexible, message or concept. It has drama and interest and even humor (as in “Yeah, right”). The photograph is on the ragged edge of believability…is it real or not? And finally, the photo is timeless, something I think is tremendously important for long-term success in the stock imagery business. Sculling has always been a strong metaphor for teamwork, and as such has been used countless times as a stock image. This version still speaks of teamwork, but takes it a couple of steps further. This is teamwork in the face of risk, challenge, adversity and perhaps even the impossible. I can’t help but think that an appropriate headline might be “Sometimes even teamwork isn’t enough”. Come to think of it, this image might be hitting a little close to home for us photographers! As I have mentioned before, old concepts, illustrated in new and different ways, with a strong message pertinent to the marketplace, tend to do well. This image represents any efforts being attempted by a team, but with huge challenges and an uncertain outcome at best. It could be the government attempting to deal with the recession, or a sales team overmatched by competition, or any number of other situations in which an entity, be it corporation, government or organization, is faced with huge obstacles. For example, I could see this being an editorial image about the government attempting health care reform! This image is also a great example of how I work these days. I come up with an idea that I want to illustrate, and then build a more comprehensive shoot around that first idea. In this case I knew I needed four models (to replace the people I had originally photographed in the boat, two of whom were just kids). Then I went over my comprehensive list of ideas to see which other ones were waiting for me to shoot models in-studio in order to finish. I came up with 17 ideas. I knew that I would not be able to complete the photography for that many, but I wanted to make sure that I had extra ideas in case one or more of my planned ones just weren’t working out. As it turned out, I managed to get the raw materials shot for about eleven of the ideas. In my studio I set up the lighting to match that from the original sculling shoot. Since I had shot the boat from a bridge I stood on a ladder to get the correct perspective. I printed out an 11x17 print of the boat and kept it with me on the ladder. I then shot each model and compared the LCD image with the print to make sure I cam at least reasonably close to the poses that would work. Before letting the models go I also did a quick cut and paste in Photoshop just to make sure things lined up right. I put this image together using four model shots, the boat, and three shots of waves taken from atop a bluff in the Marin Headlands on a day with particularly large swells. I crafted it in such a way that it can easily crop as a horizontal for, say, magazine spreads, or vertically for a magazine cover. There is also plenty of room for headlines and body copy, though the texture of the water might be a bit busy for that. Total Photoshop time was about six hours. While the concept of teamwork is one that is always in hot demand, as are such themes as risk, challenge, and adversity, having the rather negative probable outcome as part of the image makes me think that the audience for this photograph will be on the small side. Combine that with the greater-than-ordinary amount of work that goes into such an picture, and I think it would be best served as a Rights Managed image, so that is how I am submitting it. And now I have ten more images to get back to working on! 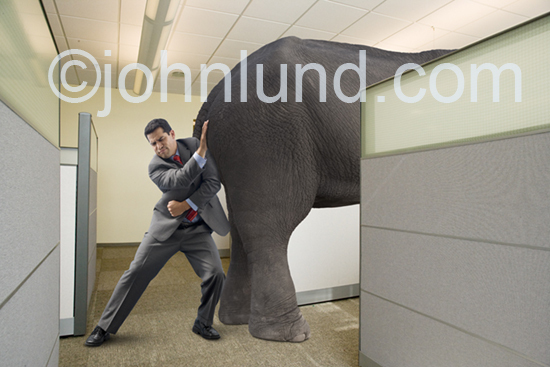 A businessman pushing an elephant out of the room was created for the stock licensing market. 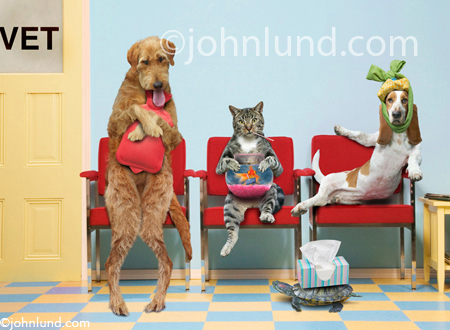 This funny animal photo was create with the consumer market in mind. I believe are many more potential purchasers of photography doing Google searches (what I will call the “consumer” market) than those searching stock agencies. This “consumer” market includes everyone looking for fine art prints and bathroom wall décor to photo-imprinted coffee mugs, tote bags, T-Shirts, greeting cards and, yes, licensing stock photos (though they might not know that they are seeking to license a stock image). I also know that it is a heck of a lot easier for me to make money by licensing stock through the traditional agencies than it is for me to license images directly or to penetrate that consumer market. As I have said before, if I want to earn more money as quickly as possible then I should be shooting as many pictures (intelligently) as possible and getting them into Blend, Corbis, Getty, Kimball and SuperStock (my agencies in alphabetical order) as quickly as I can. Similarly, I can earn significant money by getting more greeting cards of my silly animal pictures into the market through brick and mortar publishers. After over a year of pushing SEO, upload and key wording images, blogging, writing articles, and putting images up on Imagekind and CafePress, I have learned a couple of things. Firstly, it is a TON of work! Secondly, there is progress but it is agonizingly slow. I have gone from an average of one unique visitor per week to my website, to an average of almost 500 a day. I have gone from about 1 sale on CafePress every couple of weeks to pretty much an average of one sale a day. And don’t forget all the click-through ad revenue…about $5.00 a day. Given all of the downward price pressure from low price stock and an oversupply of images the idea of trying to pump out more and more images, and adding to that oversupply, just doesn’t make a whole lot of long-term sense to me. I still very much believe in stock photography, and frankly, particularly looking at my Blend sales, I’d have to say there is still a lot of life left in the old girl yet. But it ain’t like it used to be. Not in RF or RM. But creating more new quality content can still work for both the short and long term. I used to make a killing in greeting cards as well, and I am down about 70% on those (I am only down about 30% on stock photos but still earn enough to make me feel a little guilty). Given that the greeting card company that used to publish my cards made some seriously questionable business moves (like firing their entire sales staff), it is unclear how much of that drop is due to the changes in the photo market and how much due to bad business decisions and the recession. This brings to the point where I am now, trying to continually adjust my time and efforts to provide for the maximum return. I have to look at both the short and long term. For me, the short term is creating images and getting them to the stock agencies, what Seth Godwin would term “shipping product”. The long term, for me, means tapping into the vast powers of the internet and continuing to build traffic to generate income from that “consumer” market as well as guide more users of stock photography to my images at the various agencies that handle them. 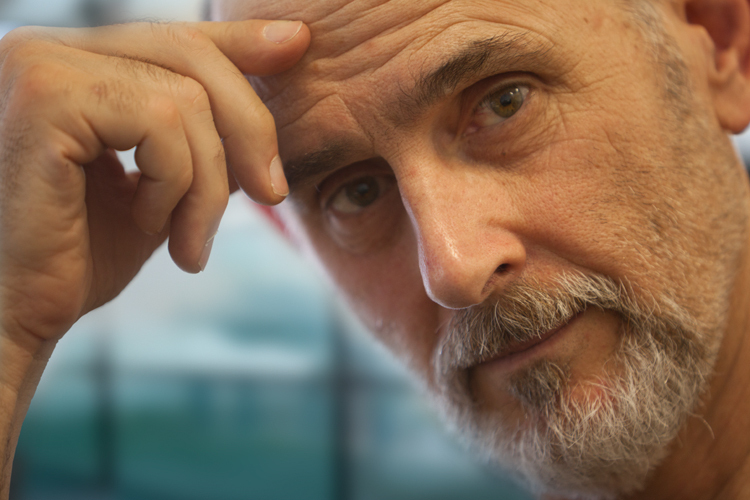 The seemingly slow nature of that process is secondary to the evidence that it does work. Ultimately, they all work together. Creating more images for agencies, which I can then put up as additional content on my site, will both generate that short-term income (hopefully middle-term and long-term revenue as well), and will generate more traffic that I can channel into various income streams. My tasks, then, are to create compelling stock photos, market-needed images, get them onto my site, and continue my SEO through key wording, blogging, article writing and link-building. In short, creating quality content for the agencies and my site. I guess it boils down to patience, perseverance and perspiration…all with a sense of urgency.